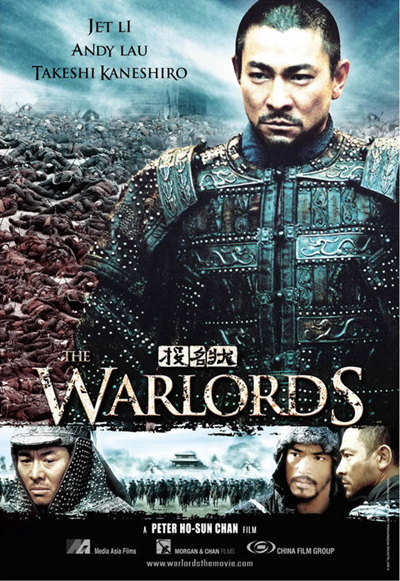 Warlords a film by Peter Ho Sun Chan based on the Qing dynasty when the land was ravaged by war and corruption by a decade long civil war,out of this time this film is based on three heroes who unite to crush the opposing armies,but at the cost loyalty,friendship and honor. 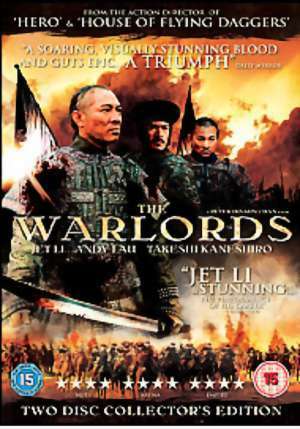 Starring three of the biggest names in Asian action cinema it starts with Jet Li playing General Pang who has just been defeated in battle by the Taiping army and had lost all his troops and was the only survivor because of an alliance with the Ho army that went sour when the Ho army looked on whilst Jet Li's Ching army was slaughtered .Coming round after the battle as he played dead to survive. 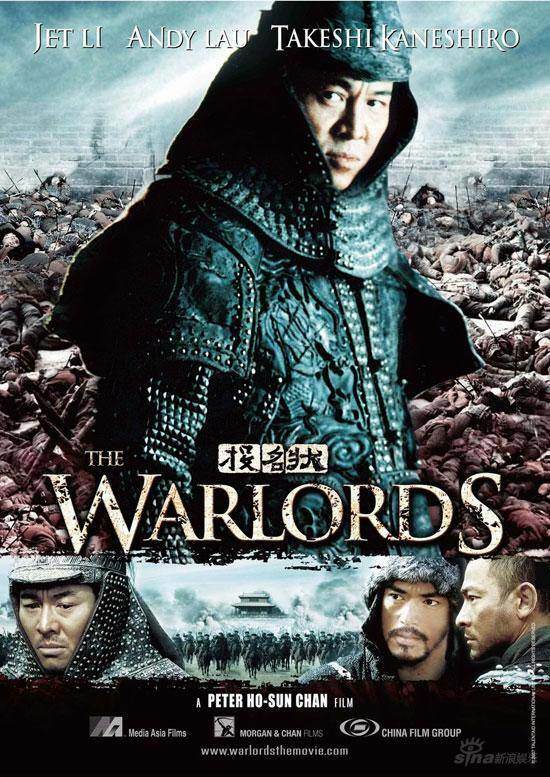 After collapsing he is helped by a young woman who helps him take refuge in a deserted house and keeps him warm with soup and other means.The next day he is spotted by a group of bandits led by Takeshi Kaneshiro who enters in to a fight with him ,because he wants his boots when this proves difficult for Takeshi's character so he decides to be his friend and take him to the bandits village to meet his brother Er Hu .Now Er-Hu is a bandit and leader of the village and his a hero to the locals and does not openly welcome Pang as he is a soldier from the Ching army and has a another agenda.He welcomes him to eat and stay the night but leave in the morning.Now being bandits they steal food and supplies from various army factions and wherever to survive but when the Ho army arrive that night to take back food and supplies that Er-Hu had stole to feed his people they are left without anything and face starvation. Pang promises that if they come with him to join the Ching Army their people will never go Hungary again.With much thought Er-Hu agrees but not without losing part of his group who don't like Pang.On top of this the woman who helped Pang happens to be Er-Hu's woman so a Love Triangle is also in the making.Now the only way to get the Ching Army to accept them ,Pang decides they must capture a Taiping supply convoy and bring gifts to the Ching who are fighting a losing battle.Together the three men unite and vow to stand by each other as brothers in battle.On taking the supply convoy in a victorious manner they head to the Ching to offer there services and Pang to apologize for losing his army in battle and going AWOL for two months. Now with apprehension the Ching accept these warriors and offer support in the form of another generals army but only as a visible presence.They are only 800 strong and the visible presence is 1500 strong ,but they must engage in battle with the Taiping rebels who are 5000 in force.At the leadership of Pang they attack the Taiping rebels at a cost of there own men who must sacrifice so they can charge the front line of Taiping rebels who have rifles . 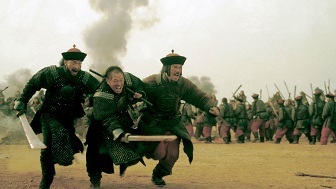 What ensues seems to be a losing battle but through passion and brotherhood they smash there way in to the Taiping 5000 strong army with just 800 men and this proves to much for the General who is there to offer a visible force who in turn engage his Unit of 1500 men to help.This proves victorious for Pang and he is summoned to the Ching Head quarters and is given control of 3 units and the help of other generals.if he can seize the Taiping Stronghold of Suzhou. 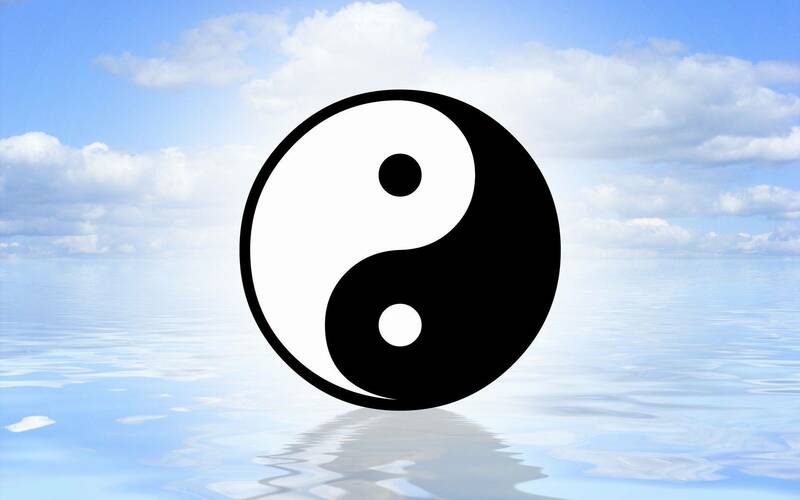 What follows is a long battle as they are unable to penetrate the city of Suzhou and lay up in there trenches losing men for many months on end. 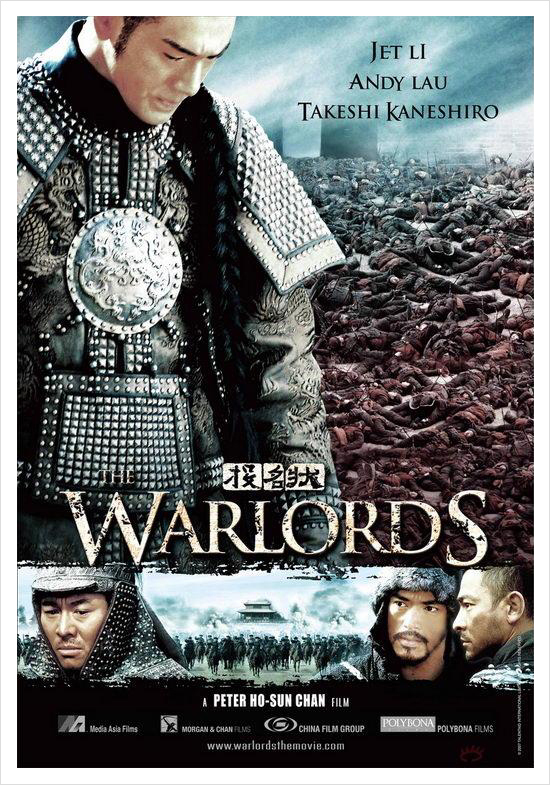 Now with out giving to much away what we have here is a masterful film which showcases Jet Li's acting ability (something you don't see in his American flicks) his portrayal of Pang the General is brilliant and at times downright nasty,couple this with Andy Lau Tak Wah's portrayal of Er-Hu and Takeshi as the the younger brother and you have a winning formula.Now there's not many films starring these people that could have you changing your views of the main characters so much .Pang is a nasty piece of work who in the end is out for self glorification by the looks of it and Er-Hu is a man that fights for peace and to help people but at the beginning of the film you would not think this.Peter Ho-Sun Chan has done a top job with this film and why it has passed me by for so long ,i don't know. 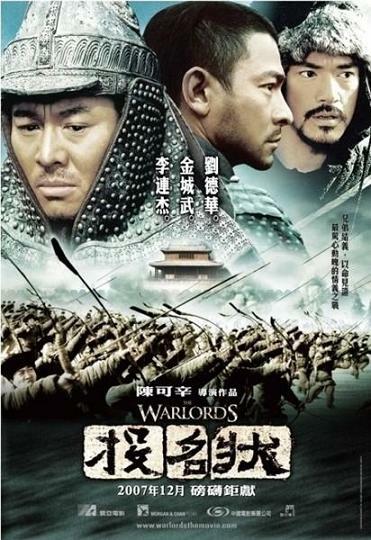 I did find my self routing for Er-Hu towards the end as Andy Lau is just perfect as Er-Hu and i always enjoy his films .Takeshi is good as always but does not get to shine in the same way as he did in House of the Flying Daggers or The Returner.but his Part is crucial as it's told slightly through his eyes and narration.And even though Jet has excelled him self here Andy Lau stole the show for me. A top film that blew me away. The version i watched was the one from Metrodome on region 2 pal and was the 2 disc collectors edition ,with special features on a separate disc ,which include a production journal -deleted scenes-Trailers- A history of the Warlords and more.The film was anamorphic and carried both Dolby Digital and the DTS soundtracks.But did find the subtitles a bit dodgy at times ,well at least on my copy.But i did find it cheap online. But maybe i wished i had purchased the original Region 3 release from Hong Kong.